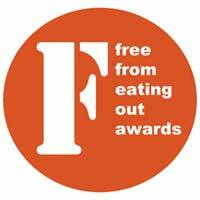 You are here: Home / Living Gluten Free / Have you come across Graze yet? Graze send out healthy snack boxes containing fruit, nuts and seeds to your home or office – or as a one-off gift to a friend. You can choose how frequently you want to receive a box, and each one contains three smaller packets of goodies. The largest of these boxes contains fresh fruit, prepared and ready to eat: we’ve received fresh pineapple chunks, fresh apple slices, grapes and cherries. 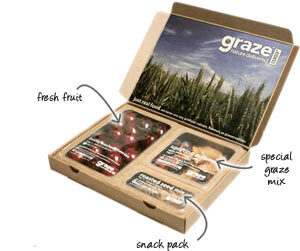 The middle size box contains one of a wide range of special graze mixes of nuts, seeds, and dried fruits/berries, and the smallest box is a snack pack. Some mixes are spiced, some are impregnated with juices, and some are natural. You can elect to receive olives, but these are slightly more expensive. And apparently, sometimes a mix includes chocolate, but I’ve not seen any of those yet! Everything we’ve received has been delicious. My particular favourites have been the spicy nut and seed snacks and selections, but be warned: these almost all contain gluten. You can see this if you look at the ingredient list, but it would be helpful if these were marked up clearly, without having to review the ingredients. And the fresh fruit has all arrived in perfect condition, including the sliced apple, which wasn’t browning at all. The packaging is minimal, and very attractive, and is as green as possible. On the negative side: the boxes are quite expensive at £2.99 each, and it isn’t possible to automatically exclude all mixes containing gluten; you’d have to mark each item as unacceptable. However, the technology may be there to enable this, as when I selected ‘don’t send me fresh apple’ (because that seemed a particularly expensive item to receive) the system did ask whether I wanted all items containing apple to be removed from my list of options. Graze, can you help with this? This is a fairly new company, and I wish them luck. Sending out healthy snacks to homes and offices is a great idea; but this is a difficult environment to be setting up a new business in, particularly one in a niche and discretionary area. For the moment, at least – this may be a startup offer only – you can receive your first box free, and your second half-price if you click on this special link to Graze. Plus, I’ll receive a discount on my future boxes if you sign up using that code, which sounds good to me. Just watch out for those gluten-containing elements!